Indoor Growers: Consider Your Eyes! 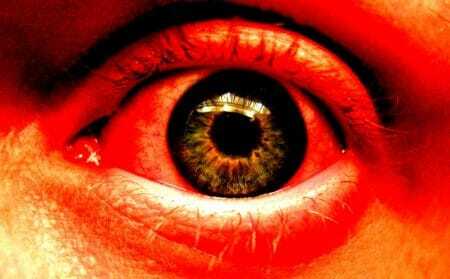 Protect your eyes when growing marijuana indoors! 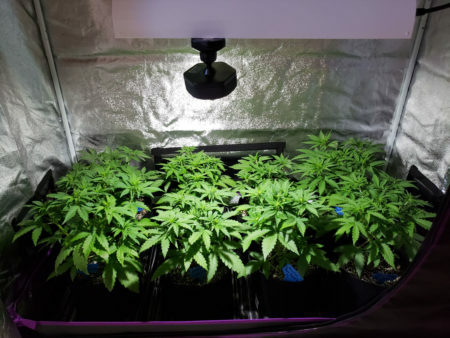 Indoor grow lights, especially high powered lamps like MH / HPS, LEC and LED grow lights, can be dangerous to the eyes of humans and pets if you are exposed to direct light. 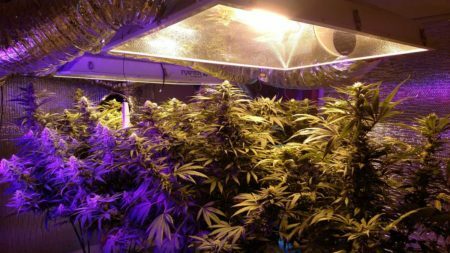 Let’s go through a couple of simple steps you can follow to make sure you’re keeping your precious eyeballs safe while you’re under a high-powered grow light. Tending to the garden exposes you to a lot of time under grow lights. It’s important to protect your eyes from high-powered lamps like MH, HPS, LEC and LED grow lights! If you plan on spending more than a few minutes at a time with your plants (for example when training or watering your plants), then it can be a good idea to turn off the grow light for a little while. Another reason might be to protect your pet’s eyes while allowing them to be in the room with you. I know I enjoy letting my cat watch me work in the grow room (though if I look away too long she’ll nibble on the leaves!). This is the small, battery-powered light I use when tending the garden. It comes with a strong magnet at the base so you can attach it to anything that’s metal, like a hood (keep away from your ballast if you have one built in) or the bars of your grow tent. As you can see from the picture below, it does a pretty good job of spreading light over a relatively large area. Turn off the grow light when you plan on spending time in the garden and use a smaller light that will let you still see your plants clearly without causing strain on your eyes. Unplugging your grow lights should be all it takes to turn them off. If growing photoperiod plants, make sure not to accidentally alter your light schedule, and be careful not to unplug your timer if you’re using one! Note: It’s a good idea to wait at least 5 minutes between turning grow lights on and off to prevent unnecessary wear and tear on the bulbs and/or ballasts. If you’re going to be spending time near the grow lights while they’re running, the most important tool to safeguard your eyes is a pair of protective glasses. It’s a good idea to put them on even if you’re just going to peak in the tent. 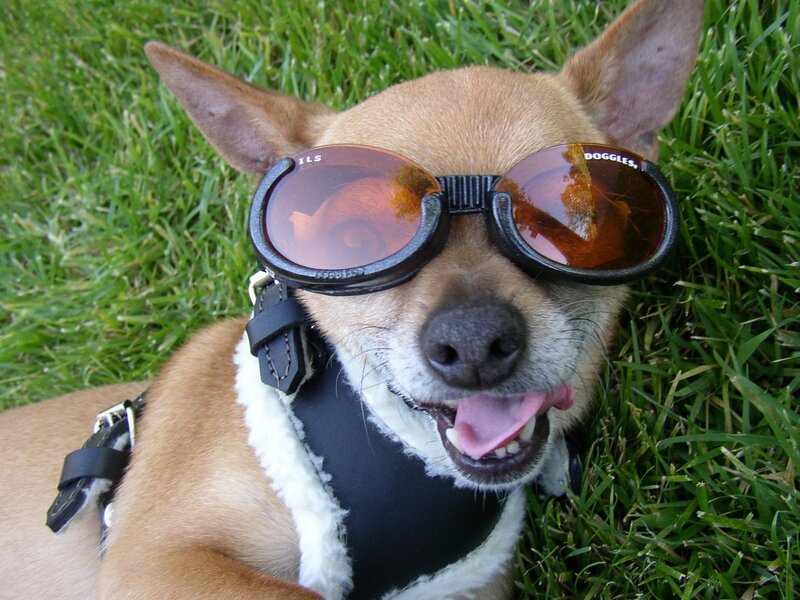 High-quality polarized sunglasses work great if you have a pair laying around. If you’re looking for something more growing-specific, then you might consider getting sunglasses that are both protective and color correcting. 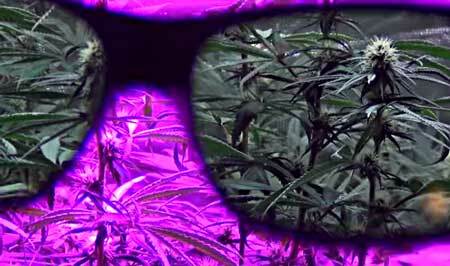 Color corrective glasses not only protect your eyes, they allow you to see your plants in full color even under unnatural colored light from HPS or LED grow lights. MH or CMH / LEC grow lights – Metal Halide and Ceramic Metal Halide / Light Emitting Ceramic lights produce a beautiful, relatively natural colored light which allows you to easily see your plants in full color, but they also make UV rays. The extra UV light is good in that it may increase THC or trichome production on your buds, but it’s really bad for your eyes. Don’t skip getting protective eyewear if you’re using any of these types of grow lights with your plants! Get Apollo Horticulture Grow Room Glasses (super cheap generic version, works great) or Method 7 Metal Halide Plus glasses (much more expensive, but very high quality). I own glasses from both companies. I do like the Method 7 ones better, as they’re sturdier and seem overall higher quality, but honestly, the Apollo ones work great and you just can’t beat the price! If you’re not sure which to get, I recommend going with the Apollo ones unless you really are looking for something that will stand up to a lot of wear and tear. HPS Grow Lights – HPS grow lights are very electrically efficient and produce a LOT of light. The harsh yellow light can help promote flowering but makes it very difficult to see your plants in full color. This means that sometimes you might not notice problems like discoloration or yellow leaves for a few days. 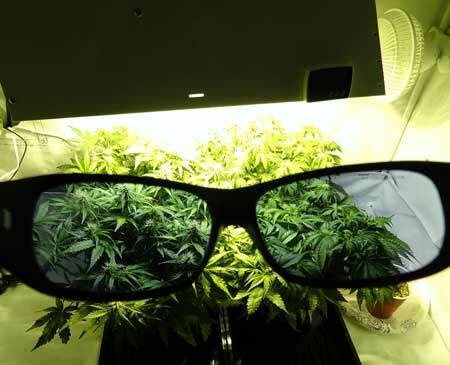 The great thing about protective eyeglasses for HPS is you can purchase glasses that actually correct the color of the light for you, so you see the plants in their full glory! Get Apollo Horticulture Grow Room Glasses (super cheap generic version, works great, though not as good at correcting yellow light) or Method 7 HPS Plus glasses (much more expensive, but very high quality and will make plants appear to be in full color). This is what an HPS garden looks like through Method 7’s HPS Glasses. The cheaper Apollo Horticulture Grow Room Glasses aren’t quite as good at correcting color, but will definitely help a lot. You can see all the leaves in full color while protecting your eyes. You can even take pictures through the lenses. LED Grow Lights – LED grow lights typically produce a purple-ish light that can cause eye strain for some people and can make it difficult to see when your plant leaves are unhealthy. For example, if they’re yellow or discolored they may not appear any different under the LED lights. Some of the best LED grow models use lenses to help focus the light down onto the plants, which is great for yields, but can also cause the light to be focused in your eyes if you look at the LED the wrong way. Luckily there are glasses that are made to prevent eye strain, protect your eyes, and let you see your plants in full color even under LEDs. Get Apollo Horticulture LED Grow Room Glasses (super cheap generic version, works pretty well) or Method 7 LED Plus glasses (much more expensive, but very high quality). The cheaper Apollo LED glasses get the job done and the price is right! This is what a cannabis plant looks like through Method 7’s LED Glasses. 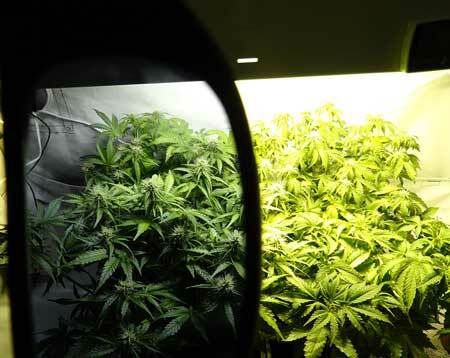 The Apollo Horticulture LED Grow Room Glasses are at least 80% as good and far cheaper. Even when you’re wearing protective glasses, the grow lights can still beam down on your forehead and face while you’re tending your plants. This not only makes you hot, it’s not good for your skin and some light still gets to your eyes! I always wear a hat in the grow room when the grow lights are on, especially if working directly under the lights. It not only makes you feel more cool and comfortable while you’re working, it also protects your skin and gives your eyes further shade. Even a baseball cap will help! Spending time in the grow room is rewarding, and your plants love the attention, but when it comes to growing cannabis indoors, make sure you also consider your eyes! Don’t strain your eyes, protect them!